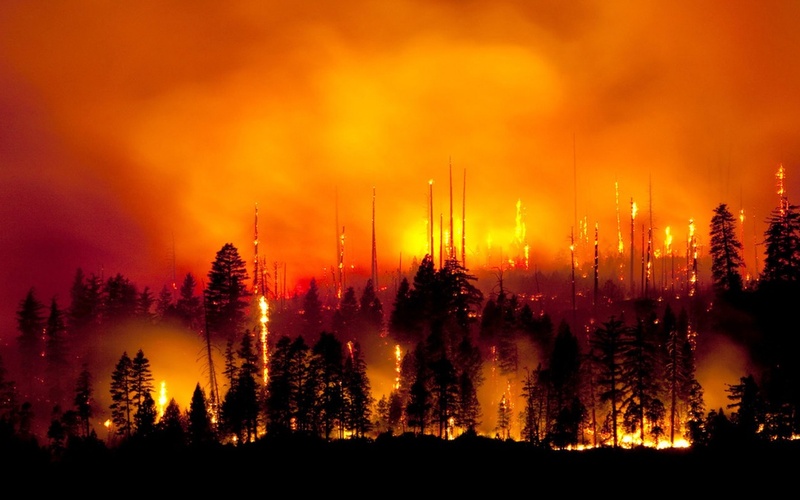 Every year, wildfires burn across the U.S., and more and more people are living where wildfires are a real risk. legally, being sure to secure the appropriate permits. by large fire vehicles to your property. 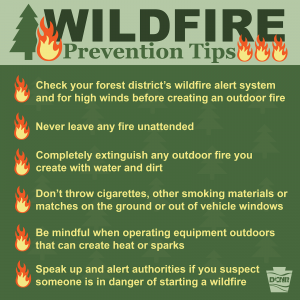 · Report hazardous conditions that could cause a wildfire. · Teach children about fire safety. Instill in them that fire is a tool for adults, not a toy. Keep matches and lighters out of their reach. · Post fire emergency telephone numbers. · Plan several escape routes away from your home – by car and by foot. · Talk to your neighbors about wildfire safety. Consider how you could help neighbors – such as elderly or disabled persons – who have special needs. Make plans to take care of children who might be on their own if parents can’t get home. · Create a 30-100 foot safety zone around your home. · Rake and remove leaves, dead limbs, twigs and rubbish from around and under structures in this zone and clear all flammable vegetation. · Prune tree branches and shrubs within 15 feet of a stovepipe or chimney outlet. · Regularly clean roofs and gutters, and inspect chimneys. · Remove vines from walls of the home. · Store gasoline, oily rags and other flammable materials in approved safety cans. Place cans in a safe location away from the base of the buildings. combustible material within 20 feet. Use only wood-burning devices evaluated by a nationally recognized laboratory. · Identify and maintain an adequate outside water source such as a small pond, cistern, well, swimming pool or hydrant. · Wear protective clothing: sturdy shoes, cotton or woolen clothing, long pants, a long-sleeved shirt, gloves and a handkerchief to protect your face. · Lock your home when you go. · Tell someone when you leave and where you are going. · Choose a route away from fire hazards. Watch for changes in the speed and direction of fire and smoke.